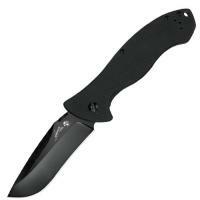 The 6045BLK Emerson CQC-9K Plain Edge Folding Knife is designed by Emerson and built by Kershaw. Combining Emerson's eye for design and Kershaw's quality construction, the 3.6-inch, drop-point blade is constructed of 8Cr13MoV stainless steel for a hard blade that holds an edge and resists wear. The recurve shape allows the knife to cut through rounded objects, such as hoses or ropes, quickly and cleanly. The handle is made of G10, a glass-based epoxy resin laminate, on the front and black-oxide coated steel in the rear. The front offers texturing for a secure grip even with wet or gloved hands, while the back incorporates a secure frame lock to safely secure the blade when in use or stowed. The entire handle is contoured to fit even the largest of hands comfortably. Emerson contributed its patented "wave-shaped opening feature," a tab on the top of the blade that is designed to catch on the user's pocket and deploy the blade as it is pulled out of the pocket. Military, law enforcement and first responders alike find this quick-open feature particularly useful in emergency situations. Alternatively, the knife can be manually opened using its thumb disk. The CQC-9K can be transported easily using the reversible pocket clip or threading a lanyard through its predrilled hole.